The Gannen XP features the best measurement uncertainty of any 3D probing system. This combined with an isotropic stiffness, an extremely low weight and compliant design allows for ultra precision 3D measurements on small and/or fragile components that could not be measured by other tactile probes. 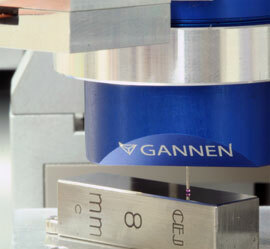 The basis of the 3D Gannen probe is a silicon chip with integrated piezo resistive elements. One point probing and scanning is possible with ultra low uncertainty. The probe is lightweight with a colliding mass of approximately 34 mg. Combined with a stiffness down to 150 N/m this allows high speed measurements with probing forces down to a few micro Newtons, depending on the CMM used. The probe is calibrated to establish the relation between the probe tip displacement and the signal as measured by the piezo resistive strain gauges. The calibration can be performed on the Coordinate Measuring Machine (CMM) itself or by XPRESS Precision Engineering. Measurements using the XPRESS probe shown a 3D uncertainty of 50 nm and a 1D repeatability of 2 nm or less (standard deviation) in any direction and over its entire measurement range. The drift of the probe is mainly caused by temperature variations. For temperature variation of 0,1 K or less, comparable to the environment in a low uncertainty Coordinate Measuring Machine, the drift is approximately 10 nm.